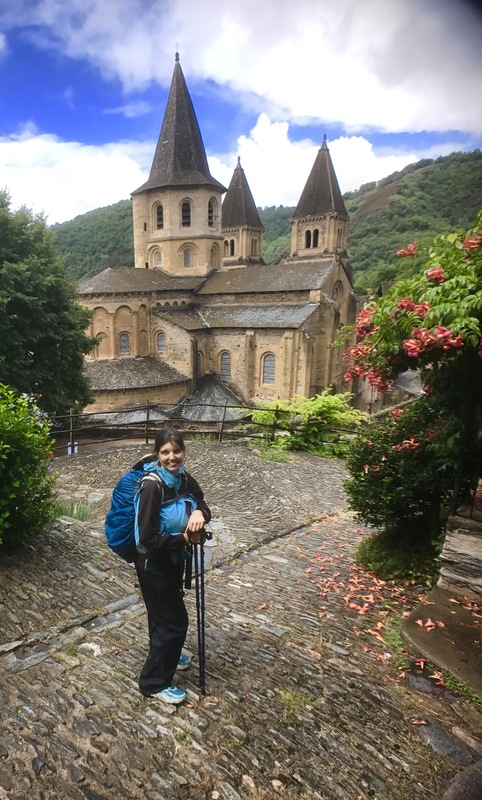 I arrived in Conques at noon on Saturday, July 1, after walking just 12 km (aka 7.5 rainy miles, including one particularly challenging rocky, slippery descent ). Check-in at the Abbaye St Foy did not begin until 2 PM. So I dropped off my backpack in their courtyard then went for a walk on the streets above the Abbey Chuch of St Foy. The abbey church of Saint Foy. 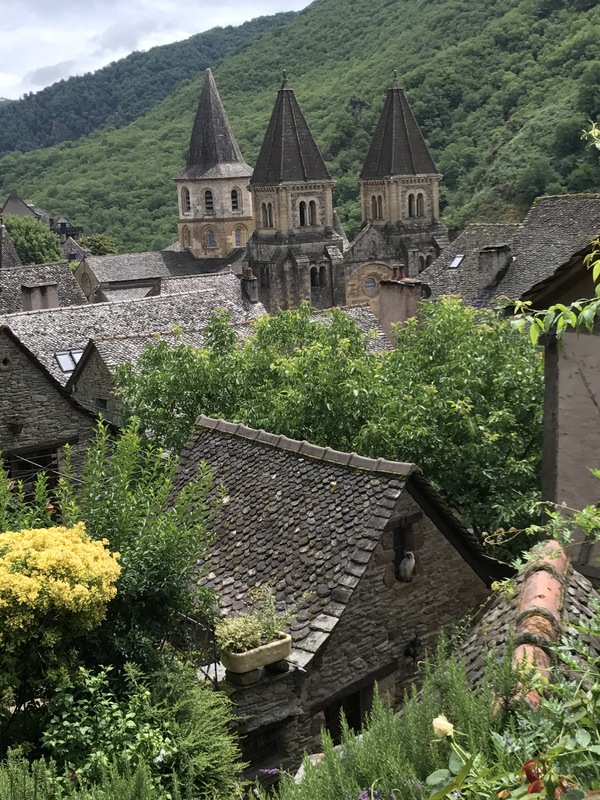 Conques, France. 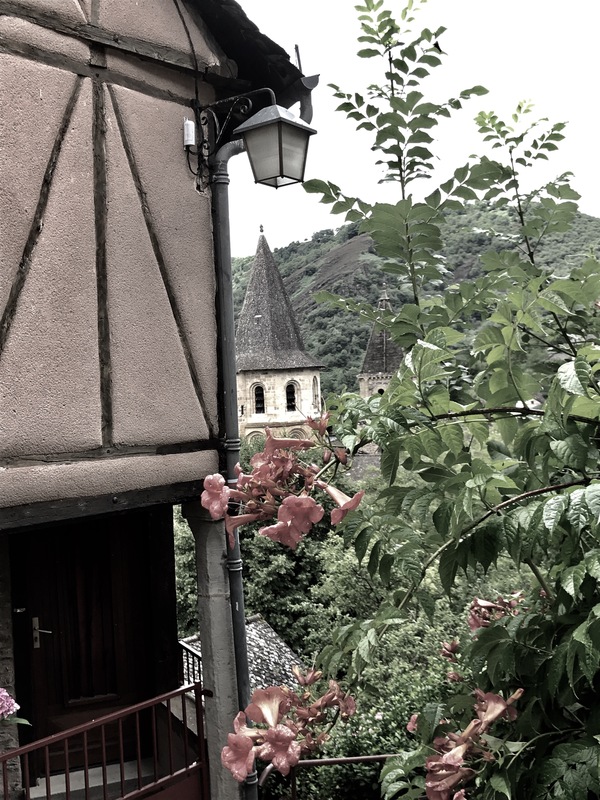 So what’s the big deal about Conques? You may want to sit down for this one . . .
At the end of the eighth century, a hermit decided this was a nice place to hide out. I would agree. There’s nothing but mountains of trees surrounding this place. And there were some natural springs. Nature? Check. Freshwater? Check. What more do you need? So the hermit is hanging out, but then a group of Benedictine monks, needing to escape Spain, decided to settle here. So the hermit left. The monks needed to get people to visit the chapel they built there. Visitors bring their money, you see. (Some things never change!) This was in the 800s and the idea of having relics to attract prestige was coming into fashion. Relics are generally body parts (usually bones) or belongings of a deceased saint. So how does one obtain such relics? Well, in the case of Conques, you steal them. From the monastery in Agen. In 866. Some of you may recall that the eighth commandment says you shall not steal. So how does a Catholic monastery get around this one? You don’t call it stealing. It is referred to as a “furtive transfer.” This is the part where I remind you write why I write memoir: true life is just so darn interesting– why bother making up something else? Anyway, back to my story. So the monks “furtively transfer” the relics of Saint Foy to Conques. “Foy” means “Faith.” Faith was a young woman of 21 years who, in 305, refused to pray to pagan gods and was therefore killed. In Agen. So now her relics (in this case, the top of her skull) are in Conques, and just as the monks desired, pilgrims come to see them. A gold statue reliquary is built (a reliquary holds relics). Then covered with precious stones as well. This statue reliquary is one of very few that have survived this long without incurring any damage. Thus, it’s a pretty big deal. 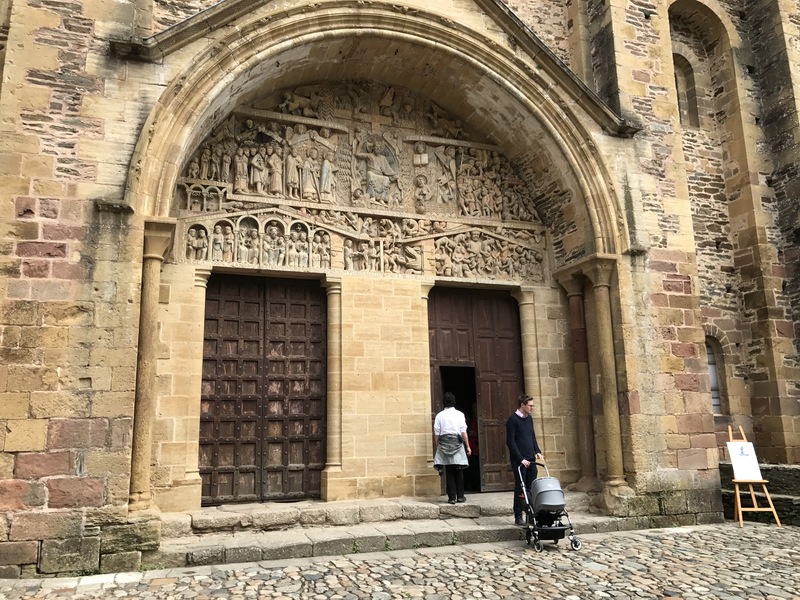 By the 11th century, pilgrims to Santiago de Compostela were numerous, and were stopping to see the relics here (prior to and after the furtive transfer, Conques had been gifted other relics as well). The town was prosperous thanks to all the money brought in by these visitors. So they knock down the chapel and build the Abbey that is here now. 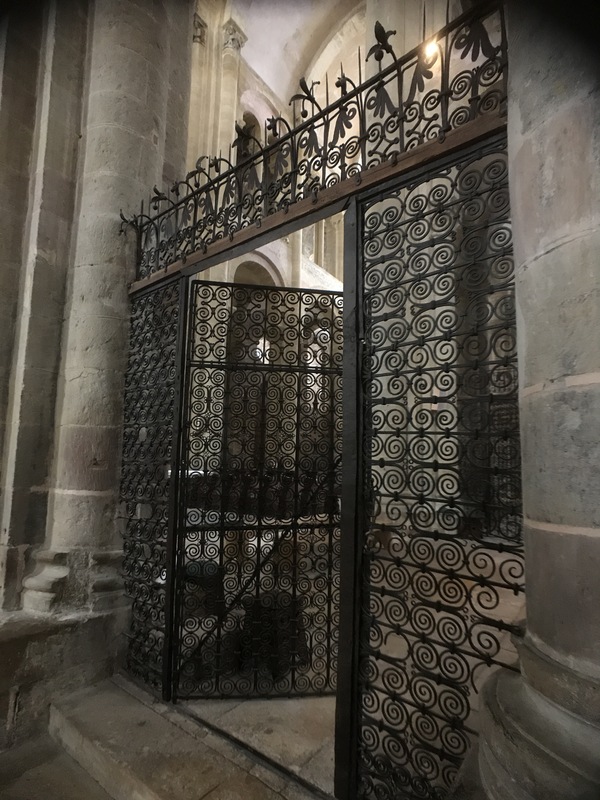 Prior to 1910, the relics were housed behind these gates. In 1910, they built “The Trésor” (“the treasure”) to house them. The Trésor, I read, is not a museum for the very fact that they actually take the relics of St Foy out for a procession once a year (on or about October 6). 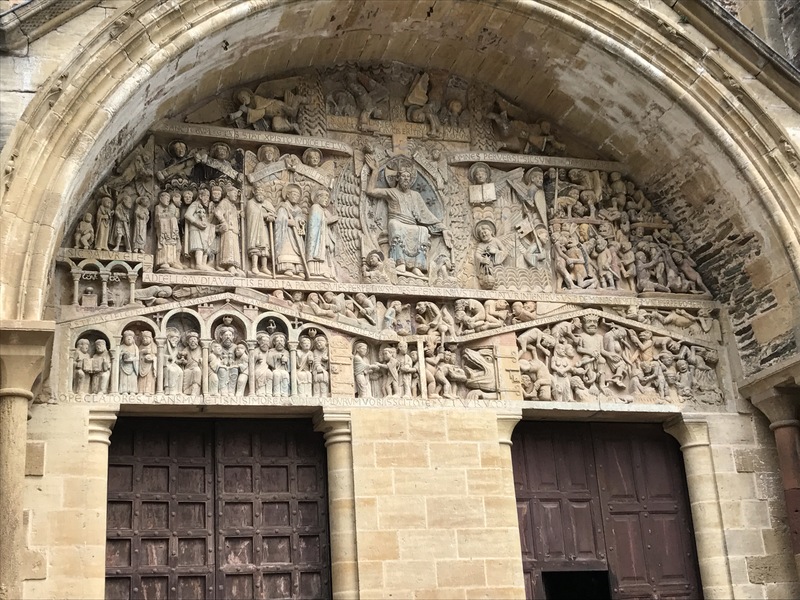 Then, in the 12th century, they added the Tympanum of the Last Judgement above their door. You have probably seen these in other churches on the way out the door, and there is one in the Sistine Chapel as well. Basically, Jesus sits in the middle and on his right side are all the good people going to heaven, and on his left are some pretty gruesome images of what’s happening to the people that are going to hell. This image was popular at this time as it made very clear to those that were illiterate what could happen to them . . . I learned all of this over the course of my two days and two nights in Conques. I didn’t necessarily need a rest day as I hadn’t been walking nearly as much as I had planned due to the heat and then the rain. But I’d heard this town was a lovely one. And after two weeks of walking, I welcomed the break. ← Pay me later. Much later.